Our services include precision cutting, forming and bending, general and specialist fabrication. We services the construction industry and we stock a full range of steel, stainless steel, aluminium and various exotic metals. Nevco Engineering is a fully integrated steel manufacturing business with a focus on problem solving. Nevco Engineering is a fully integrated steel manufacturing business with a focus on problem solving and design. Our services include design consultancy, contract manufacturing, rapid prototyping, precision cutting, forming and bending, general and specialist fabrication. We engage with a broad array of industries including rail and road transport, water and electricity infrastructure, manufacturing, mining, construction and retail fit out. We focus on problem solving and design using our SolidWorks 3D CAD capability. We design and manufacture across a broad requirement and are available to service urgent or special requirements. We manufacture from client designs and drawings and offer a full drawing service for fabrication requirements. Custom made structural and mechanical components for rail and road transport, water and electricity infrastructure and mining industries. 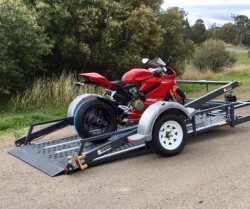 A range of unique GROUND LOADING specialist trailers including the Nevco EZY APPROACH & EZY LOAD_Lite trailers suited to cars, motorcycles, general equipment and catering. A variety of hydraulic actuation solutions including tailgate loaders, special scissor lifts and other project specific design and construction solutions. We look forward to discussing your requirements and to being of service to you.